After I reach the Catedral de Santiago de Compostela, I will continue to Cape Finisterre. For most pilgrims, they end their journey in Santiago. I will, however, continue another 90km (55 miles) to the Atlantic Ocean. The name of the cape comes from the Latin "End of the World", for it was once thought to be the westernmost edge of Europe. Although the Camino de Santiago has seen its share of pilgrims for perhaps 1400 years, in recent centuries, people have continued to the Atlantic. Once arriving at the ocean, they burn their clothes or boots at the end of their journey. If you watched the movie "The Way" with Martin Sheen, the pilgrims continued to the lighthouse in Muxia at the same cape to bring closure to their trip. I doubt I'll be burning my clothing. But I will do something that may represent something similar. During the journey, I intend to hold a Lenten-style emotional and spiritual purge. I will write down my fears, hatreds, anxieties, and doubts throughout the trip. I'll collect these pieces of paper, gather them in a pile, and burn them to ashes. It's akin to burning the palms on Ash Wednesday. Before casting the ashes into the ocean, I might even mark my forehead with the cross as one does on Ash Wednesday. Isn't this counter-intuitive? Perhaps. Ash Wednesday marks the beginning of a penitential season, culminating on a resurrection Sunday we call Easter. In contrast, I'm suggesting to mark myself at the very end of my pilgrimage, not at the beginning. In my mind, I don my pilgrim's hat and garb and scallop shell at the beginning and throughout my walk. That is indeed a Lent-style season for me. Why should I end the trip with another mark? I think I'm drawn to doing this because I want to acknowledge that though this specific journey will be ending, my journey of faith continues onward. Moreover, I start my trip in humility and I end in humility: ashes to ashes, dust to dust. I want to be marked to recognize that though I will be finishing one phase of my journey of life, joyously I hope, I also anticipate further roads, further humble marches, whether these treks be physical or spiritual, mental or emotional. Join me as I walk to the "End of the World" and mark the beginning, middle, end, and beginning of my journey. Thank you and bless you for joining me on this transformational journey. I leave Los Angeles on September 10 and land in Spain September 11. Subscribe to the "Let All Who Are Thirsty Come" blog. One of the most compelling stops on the Camino de Santiago for me will be the Cruz de Ferro (Iron Cross). 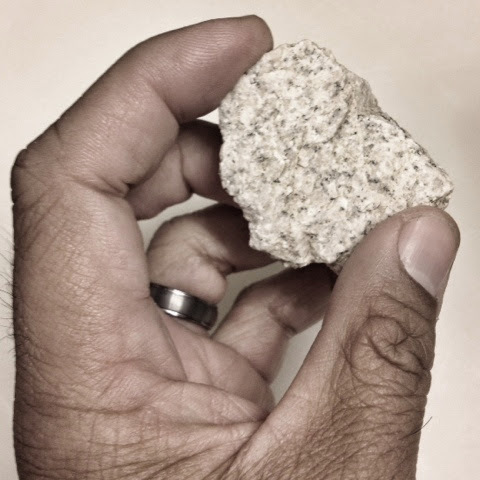 Travelers typically carry a stone or pebble from home on their journey. Upon arriving at the Cruz, they see a mound of pebbles with a large thin monument topped by a cross. The mound is made of all the pebbles and stones left behind by the thousands of travelers from all over the world through the ages. You can climb onto the mound and many travelers find the sight an important milestone indicating that they are within days of the Compostela de Santiago. I find the symbolism of the stones both astonishing and powerful. Prior to the trip, peregrino travelers are instructed to reduce, Reduce, REDUCE the weight of their pack to make this arduous, long journey more tolerable. (Don't let your pack without water exceed 10% of your body weight! Egads, my work briefcase weighs more than 10% of my body weight.) And yet, they carry with them a rock along most of the route. Why on earth would you carry unneeded weight on such a journey? To me and to the committed peregrino, the stone represents all the physical, mental, and even spiritual that weighs you down in life. And whether you realize it, acknowledge it, or deny it, that stone follows you on your journey. It follows you every day of your life. It's in your bags, in your head, in your heart. Try as you might do otherwise, you begin any pilgrimage with unnecessary baggage. Emotional or spiritual, granite or mental, that baggage will slow you down. It's humbling to know of the stones in your life; it's bewildering and frustrating to not know the stones in your life. The Roman Catholic Franciscan friar, Father Richard Rohr, describes this process as letting go. I imagine seeing the cross and wincing. A growing understanding will strike my heart and I'll understand what I need to leave behind. Like the thousands of pilgrims, I'll leave the weight at the cross, asking our Lord to carry my burden for me. Will I be alone or walking with newly made friends? I won't know for another month. But when the time comes, I'm sure I'll learn much about that which hampers our personal progress. I ask my friends to use me and my rock as their stone. Let me leave our collective impediments to growth and happiness beside the road, at the foot of the cross. I'll pray for all who wish to share their burdens and place a stone down for us all. I realize as I blog and pray about walking the Camino de Santiago that others are unable to walk or make this journey. They are on their own journey, one far more challenging in my mind than the one I am taking. I will include the link on all my blog posts. I do hope you'll consider taking this journey with me. 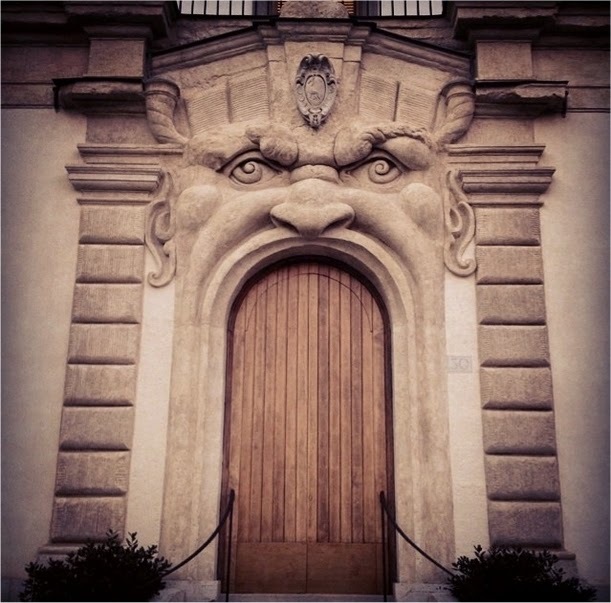 "Lasciate ogni speranza, voi ch'entrate" means "Abandon all hope, you who enter here". It's not exactly what one would think would be associated with the Camino de Santiago, a pilgrimage walk that I'll be starting in just over two weeks. The quote is from Dante Alighieri's epic poem "The Divine Comedy", specifically at the entrance into the Inferno or hell. The poem describes a mid-life visit to Hell, Purgatory, and Heaven. It's his exploration of his soul, because he was focused for too long on worldly possessions, frivolity, and politics. Why do I think of the Divine Comedy before the trip? Because it's a poem about a journey, a vision of something outside of our day to day lives. It's a magnificent reflection on values that we sustain on a daily basis but will ultimately leave us perpetually hungry, forever unhappy. I think of the dieting adage "a minute on the lips, a lifetime on the hips" taken to an infinite extreme. A misguided satisfaction leads to endless unmet need. I am thinking that my walk will be akin to the Divine Comedy. The first few days will almost certainly be Inferno. Spain may still be enduring hot temperatures, my feet will be complaining of the grind kilometer after kilometer, and my back might buckling under the weight of a pack. And who knows what joy can be found when rains come. When the first mud splatters me in the face, you can bet I'll be saying to myself "Lasciate ogni speranza". But I also see a transition, a change of perception after that part of the trip. We enter what was known in the Middle Ages as Purgatory. It's a transition place, where I do accept my state and place on the walk. I know I will eventually be away from this unhappy place, given time, given patience. Hope walks high. And finally, at the conclusion of the Camino, I will feel the satisfaction and joy in an ineffable, impossible to describe manner. Like in the Divine Comedy, when he meets God, the joy is simply beyond words. Why do I want to abandon hope on this journey? I don't really want to do so. I can't be honest about being prepared, though, if I don't recognize the challenges that might face me. One doesn't embark on a physical journey without expecting to be challenged. One should expect the same difficulties when embarking on a spiritual expedition as well. With both confronting me with each tired footstep, it would be foolish to think that I won't have my doubts, won't feel foolish, won't think twice about my trip. On the face of it, I don't have to do this trip. Yet, as many pilgrims might attest, I also feel as though I must do this walk. It's this compulsion, this urging from within that makes me wonder if I'm prepared. If I'm called to walk this way, then like Noah, shouldn't I have my doubts? So I might be saying, "Abandon all hope" not because I want to but because I'm scared and questioning why I am propelled to do it. I abandon myself to that which consumes me, the One who truly has my life in His hands. I don't need to hope in some ways, but I do need to trust. I need to trust that my Creator will guide me and watch over me. And whether tired, frustrated, or even at my end, when hope might be possible, I'll still have the trust one gives to the shepherd to find my peace. And, in due time, like Dante, I can progress to the next stages of my journey, to meet Creation. It might be on this trip, it might be decades from now. But I'm getting ready. acudamos jubilosos a la santa comunión. Some have asked me why I'm going alone on this pilgrimage along the Camino de Santiago. Perhaps they're not accustomed to traveling alone, particularly in a foreign country. Well, first some background information. When I did my study abroad back in college, I learned to travel on my own. Sure, I traveled some weekends with my mates to various parts of the UK. Most of the time, however, I took it as an opportunity to explore odd locales by myself. After the end of my study, I backpacked through Europe for a couple months. On all these trips, I usually stayed in youth hostels, with the occasional stop in a bed and breakfast or hotel. So indeed I met many people, but my particular journey was always personal, always my own. Yes, I could spend the evening or day with another person or group, but we all had our disparate adventures. We learned to cooperate and also be self-reliant. Most of those journeys were in towns and villages. I'll be walking distances approaching marathon lengths. Daily. Will I be able to do so alone? Most people travel with others. I've been speaking with the Rev. Canon Joanna Satorius of the Los Angeles Dioceses of the Episcopal Church about her very recent Camino walk. She traveled with a friend in a semi-together, semi-apart fashion. They stayed at the same places but spent most of their walking time apart, only to meet up once again at the hostels or hotels. As I talk with these friends old and new who have experienced or been exposed to the Camino de Santiago, I understand that people drift in and out of one's journey on a daily basis. There's some continuity, as you pull ahead or catch up with others and find yourself staying at the same albergues. Much of the time, you bid adieu and walk faster or slower than someone, never to meet again. My professional life has moved in a similar pattern. I've traveled millions of miles by plane, train, boat, balloon, taxi, car, subway, and air trams. People - fun people, loving people, hostile people, quirky people - drift in and out of these experiences, creating countless memories. And all of us experience transient friendships outside of the work world. In fact, it happens so often that when we are blessed with lifelong friends, it's surprising and notable. We cherish the BFFs in our lives. But the movement of people in our daily world is the norm. We can't control who comes and goes into our lives. Some move on when we're not ready to go, others won't be keeping pace with us. You come together, possibly travel as one for a distance, then realize that it's time to move on. I found myself in this situation with my prior partner. We met young, were together for a total of 18 years, and despite our efforts, drifted apart until it made more sense to go on our own. I never saw myself leaving that relationship. You'd think that my experiences traveling as a young man would have given me some insight into how relationships ebb and flow like the tide. But instead, I was devastated. I resist the notion that we must accept that people move on. The romantic notion of a true love seemed not just an ideal but also a real possibility. I've since moved on and have now married my current husband. I can't imagine being emotionally separated from him and aspire to a lifetime together. It's bucking the trend that I've described, but we're giving it a good try. So why go alone on this pilgrimage if I'm predisposed to traveling through life with someone? Moreover, why carry expectations that I actually will meet possibly lifelong friends? Perhaps the Facebook world has opened my eyes to possibilities of transient yet lifelong friends. I've made friends in so many countries, and there continue on via Facebook or in email. It's a miracle of connectivity across borders and political divides. We all grow from connections we make to the world. Of course, part of my journey is supposed to be about looking inward, seeing some aspects of my spiritual life and direction that I need to find. Traveling alone offers more time to reflect and ponder with an introspective eye. We all grow from connections we make to our true selves. When you're alone, you can stop and smell the roses. If you know me even slightly, it also means stopping to take a photo. Or several photos. From different angles. I take these photos not merely to record my memories. The photos are also, I hope, artful captures of an emotion or sentiment that strikes me. A photo doesn't merely speak more than a thousand words; an artful picture evokes words, scents, images, sounds, and textures. Traveling alone allows me to focus on what I'm feeling so that I can properly capture those sentiments in the picture. Afterwards, you can contemplate and pray upon those thoughts and emotions. On your own, you make important decisions about your direction on your own. You decide how far you can go, how to motivate yourself, when to stop, when to eat, when to start once more. But a life isolated is also possibly a life limited, and a transformational journey on a secluded island only offers so much insight.We are social creatures, intended to collaborate and to share. We're in community on our journeys of faith. We may not travel together far, or to great distances, but that fleeting emotional touch, that understanding, that sharing - they all create an expanded vision of the world and of Creation. So whether you're reading my blog daily or on occasion, I invite you to walk together with me, both alone and together. Let's interpret our journeys through our own unique eyes, and share what we've learned. And then walk on. Today I explore the concept of a pilgrimage. I described the Camino de Santiago in a prior post. But why does one even bother to go through this endeavor? What would possess me to consider embarking on such an arduous trip? My inner voice sometimes says, "Hey Mel, do you realize your goal is to walk somewhere between a 1/2 marathon and a marathon every single day, day after day, for weeks?" A pilgrimage is not to get some exercise or fresh air. I could do that here in the foothills above Pasadena. It's not to go camping or take a long trip. Again, living in California, there are many options to do this. It's not even walking for hundreds of miles. 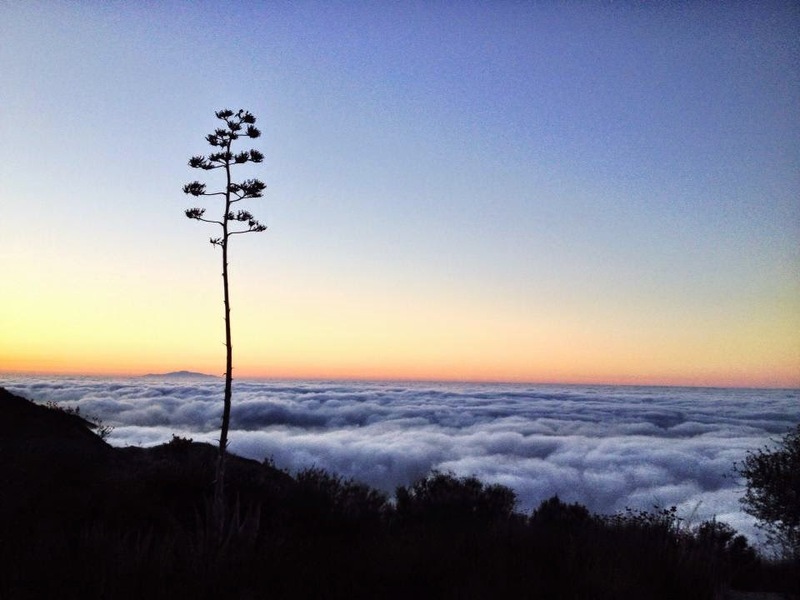 This I could do following the Pacific Crest Trail in California or the Appalachian Trail. No, a pilgrimage is a journey with a more holy purpose. It's ritualized and full of symbolism. Each step along the journey carries some meaning. One expects that a challenges will emerge, but that these challenges will enrich the pilgrim's life. Though one steps away from work, this is not a vacation. Instead, it is a "Transformational Journey". I've taken transformational journeys with my church (All Saints Episcopal in Pasadena) and on my own in the past. These journeys are meant to inspire and generate new insights. One hopes to find deeper meaning and a fuller grasp of the world, both spiritually and physically. Blessings and healing interactions spontaneously appear. In the end, you return home with wider eyes, a larger heart, and a greater connection to the divine. Not everyone who walks on the Camino de Santiago consider themselves peregrinos (pilgrims). The movie "The Way" starring Martin Sheen touched this concept very well. People can have the most obtuse and irreverent reasons for taking this journey. Many may not even be expect to have a transformational experience. It's not wrong. It's just that they don't view the journey as a pilgrimage. It's an opportunity to communicate with nature, to face a physical challenge, to be at one with Creation. It's beautiful, but it's not what I'm doing per se. I've wanted to take this pilgrimage journey for decades. It's something that's been on my bucket list but I never thought I'd find the opportunity or motivation to move forward. What changed? Well, one reason is that I got married for the first time. I've had a long term relationship, yes, but marriage equality has only been available recently. Marriage as a vocation is a sacred life and it has opened my eyes to deeper, more spiritual needs. Another reason is that I turned 50. I suppose that getting an AARP card starts forcing you to look at your mortality in a different way. Both these events marked significant milestones for me and drive me to make this pilgrimage a reality. If you are following me on this journey, what are you seeking? Are you seeking to see that I come home safely? Are you curious about the sights I'll see? Do you really want to see all the blisters I'll earn? I've used a prayer attributed to St Patrick for most of 2014 to wish people a happy birthday. It's what I wish for you, if you follow me on this pilgrimage. And until we meet again, may God hold you in the palm of Her hand. I was a teenager when Robin Williams first appeared on Happy Days. The role was a cooky one but for some inexplicable reason they spun it into a show. Oh, and what a show. I loved Mork and Mindy, but not just because of the humor. His characterization of Mork as a child-like space alien touched because he wore his heart on his sleeve. Mork was honest, sharing, and curious. Since then, Robin Williams' movie legacy has been not only extensive but surprisingly deep and particularly broad. His range was tremendous. From manic to sensitive, from restrained to loving, he carried it all. I was flat out stunned at his and John Lithgow's grasp of the characters in World According to Garp. Later on, he impressed in Good Morning Vietnam and brought me to tears in Dead Poets Society. Even in the over the top The Birdcage, he brought an amazing restraint to Armand Coleman/Coldman/Goldman that made his love for his partner more tangible. This was in the day when marriage equality was treated as a novelty, rather than something with truly emotional and loving underpinnings. Oh, and I nearly fell off the Golden Gate bridge one time as we passed each other on bicycles and I froze in awe - not a smart thing to do on a bicycle over the San Francisco Bay. Why am I reflecting on my fellow Episcopalian's passing? Because underneath this outward genius was apparently a pained and hurt individual. We can't diagnose from afar, but his substance abuse was likely linked to the underlying emotional burden. He carried his demons with him into his marriages, and we didn't have access to his tears off-screen. And yet on the screen, he wore the Greek mask of comedy or the Greek mask of drama, in different movies and shows yes, but usually within the same script. He switched them easily and with a sensitive agility. His expressive and malleable face were his masks and he wore it with brilliance. But in his movies and shows, I always thought that his eyes twinkled, raged, hollowed, and gleamed. They hinted at something that can't be manipulated by a pliable facade. They showed that he truly knew joy, felt loss, understood confusion, and cried with anguish. And from an inner place that churned these powerful emotions, we find that he eventually succumbed and withdrew his spirit to a place where he won't suffer any more. Depression isn't sadness. It's a clinical disease. The brain is actually awash with structures and chemicals that make it different than a brain suffering a bad hair day. He hid his depression on screen, but like any good actor knew how to tap into the raw energy of such feelings to drive his work. On the outside, we saw his masks of comedy and tragedy. On the inside, we can only speculate. But who else among us carries these masks on a daily basis? I raise my hand. At one point in my life, for over a year, I was in a state that I only afterwards realized should have been treated clinically. Most of the time, I was able to hide the feelings. After all, I'm extroverted, usually friendly (except to the person who cuts me off in traffic), and thinks meetings can be more productive if we're cheerfully enjoying each other's company. In fact, I was a high school yell leader. With the cheerleaders, we led the stands to cheer for a team whether we were doing well or not. In fact, it was even more imperative to be spirited and cheerful when the going was tough. No doubt, this was a perfect fit for me. But despite all that, it didn't mean the team would win. So depression to some of us can be masked for the sake of keeping things going. It doesn't however solve our own mental health problems. We reach out in ways we can, but often hide it exceedingly well. Robin Williams knew to reach out for help on his substance abuse. That we knew. If we only fully grasped that his acting continued well into the night as he walked far off screen. I pray that I understand this better in myself and in others. Our pastoral care abilities depend just as much on hearing and understanding as in helping. I truly hope that by unmasking the comedy and the tragedy facades, those who need help can be comforted and assisted. The National Suicide Hotline is at 1-800-273-TALK. The Trevor Project hotline for at risk LGBT youth is 866-488-7386. Know these numbers; share them well. One month from today, I will begin my pilgrimage along the Camino de Santiago. This blog posting today describes the route and my planned efforts. In the next few weeks, I'll describe the inner journey that I will be taking as I walk the physical one. The Camino de Santiago is the pilgrimage to the Compostela de Santiago, a cathedral on the northwest corner of Spain, in the city of Santiago in the Galician province. It's been a spiritual destination for at least 1400 years. Some refer to the journey as the Way of St James. It's purported that the relics of St James the Apostle were brought there, hence the ancient journey to Santiago. It's probably the third most popular Christian pilgrimage destination after Jerusalem and Rome. 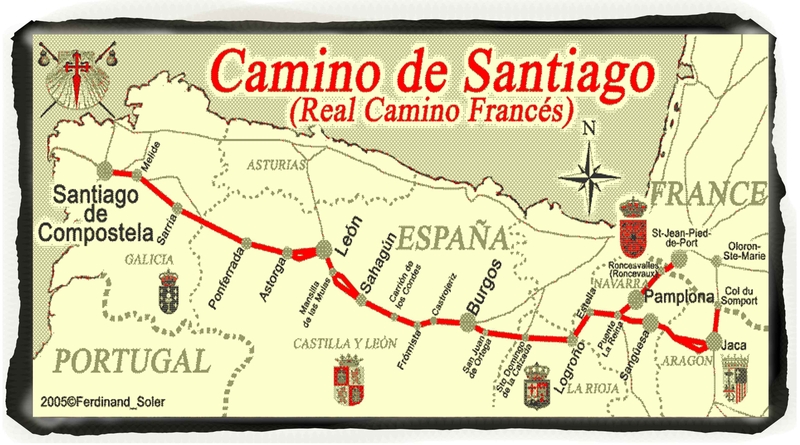 Many roads lead to Santiago, but the "French Route" from the Pyrenees is the most historic and popular. Though most still walk the 800 km journey (and some walk even longer distances from other parts of Europe), some now do so on bicycle or horseback. This is about 500 miles. Peregrinos (pilgrims) stay at the many hostels along the route or at local hotels and bed & breakfasts. Some walk just a few miles a day, others try to walk a more strenuous distance of 50 km (30 miles) each day. I won't have time to walk the entire route, which can take 7 weeks for the average person. I'll be starting halfway in the city of Burgos and, given that I'm very accustomed to hiking mountains and long distances, will be doing my 250 miles in about two weeks. I hope to arrive at the Cathedral on my father's birthday. After I reach Santiago, I'll continue to the Capo Finesterre on the coast which is another 80km (50 miles) or so away. The name translates to "End of the World", which to ancient Europeans seemed like the western-most spot on the continent. Traditionally, one burns a worldly possession or clothes and tosses the ashes into the Atlantic ocean. I will describe my intentions in a future entry. Martin Sheen starred in a 2010 movie called "The Way" about this journey. I am touched and tearful whenever I watch it. This arduous walk poses many mental as well as physical challenges. Though I will blog and post items on Twitter, I will not be on Facebook until after the journey. I hope you'll join me on this journey in prayer. I'm also considering the option of raising funds for the Episcopal Relief and Development agency to help with the crisis in the middle east. If you thing I should do this, please send me a message.